So from here let start with python. We are using the Spyder(Python) that you can get it from the Anaconda. Matpotlib is the library where we are using the sublibrary as pyplot and use shortcut as Py this will use to draw the charts. Pandas will use to import the dataset, it is best library to import dataset. Now select the code and press ctrl + enter, you can see the output in console as like below. Before importing dataset you need to set the working directory in spyder. In right side window there is fileexplorer tab select the folders where you want to move and than Just run your application by Run File (F5) command, by saving the file in that folder. Now need to import the data.csv as given in 1st step. Now run that line using ctrl + Enter. Now you can see in the variable Explorer tab and see the dataset exported like below. In python the index will start from ), if you will see the output there in below. Now we need to distinguish matrix of feature and dependent variable. Now we need to create the matrix from the three variable given there which is independent variable. Now creating the matrix of feature as X and Y. X is for independent variable and y for dependent variable. [:,:-1] – first is denoted by coloums. So by : we are taking all the column. :-1, Taking row from 0 positions to before last one. Run that line using the Ctrl + Enter. And see the output value of X you can see all the independent variable. 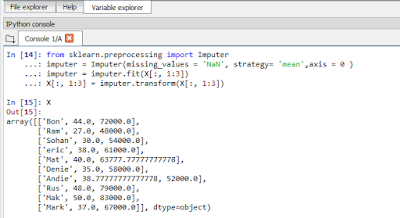 Now see the output values there as like below Ctrl + enter and check variable Y. The first problem for data is missing of data, so how we will deal with it. That is quite happen in real life. If you seen the dataset given above there are two data are missing for Mat Salary is missing and Denie Age is missing. There are option that you can remove the line and deal with missing problem but it is not a good option. There are another idea is to take the mean of the column and replace the missing data. We will use the libray to get the missing data, we are not going to create any mean data method. We will use Scikit Learn pre-processing sub library Imputer to make it done. Run that code using the Ctrl + Enter, and see the value of X. 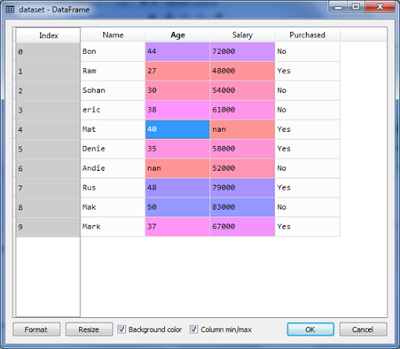 If you will see the code Mat and Andie value is filled by mean values. In machine learning model machine is learning from data, what ever the data provided to it, it learn from that. So in machine learning model we split it into two part, training set of data and test set of data. Here we import the library as train_test_split of sklearn.model_selection . Here the Test_size is 0.30 means its 30% of the total data use for test data. Full code Along with the Encoder and and scalling. This is a temporary script file.